Find latest all type of vacancies (Bharti) in Indian Air Force in 2018. 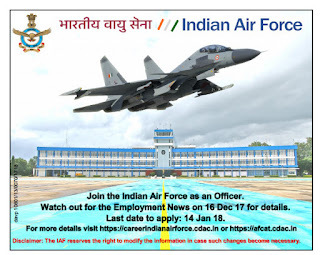 Direct recruitment of following group C posts in Indian Air Force, Race cource, New Delhi. Educational Qualification: 10th pass or its equivalent qualification. Direct Recruitment of Group "C" civilians Bharti (vacancies) under the HQ Training Command. Banglore. Age limit: 18 to 25 years. Age relaxation for SC/ST/OBC/PH/Ex-serviceman/Departmental Candidates and other, as per government rules.